Quick Links: Can anyone recommend some good aftermarket headlights for my 97? Heater control valve Keyless remote replacement Fender flare clips Will this UWS toolbox fit my '02 extra cab taco? Gas Tank Pinhole, Choices? Discussion in '1st Gen. Tacomas (1995-2004)' started by TallyCast, Sep 13, 2010. Greets. I drive a '99 extended cab, 2.4l with a manual trans. It has 165K. Among other things, it serves as a tug for a very small fiberglass egg camper. I like to tuck the camper in tight spaces and have been thinking that having a front mount hitch could be pretty cool. I've seen one on a jeep in a boat yard and there was one on a F150 at at an RV lot. Can I do the same on my Tacoma? Any clues on where to go for a testimonial from someone who has done the same thing? My front bumper got partially torn off (teenaged son learning stick) when it had less than 1000 miles on it. The front bumper has been riding lopsided ever since. So replacing the bumper with something else is not a bad thing. Ideas, suggestions and scorn are all welcome. Yup you can...Not sure where to point you for the parts for a 1st Gen...but I'm sure they are out there. I wish. I've found front mount receiver hitches for 2001 and up, but nothing for a 1999. I'm also a bit confused by exactly what I have. It's a 1999 2.4L manual, but has SR-5 badging. I thought that all the SR-5s were V6's back then? This is the first thing I came up with in a search. even says no stinger option, and I would bet they would put a receiver for a hitch in for you . I haven't a clue, so will say none. Find a welding shop that specializes in setting up vehicles to tow behind rv's. Maybe they can set you up with a 2" receiver under there somewhere. I actually found a bolt on 2" receiver at a trailer supply shop and bolted it under the front end of my Geo Tracker. Works great for the plug in corn spreader during deer season, as well as moving the utility trailers around. My big 3/4 ton is set up for towing with dual front 2" receivers for a Blue Ox tow bar. The welding shop removed the stock recovery hooks and welded them up to slot in the receivers when the tow bar wasn't hooked up. I wish I could help you out with where to find one, but as far as functionality, they are great for parking trailers in tight spots! Puts some more weight over the front end when the trailer is hooked up but if you're just parking the trailer I don't think it'll do any harm. Good luck and post pics when you find one! I'm wondering if changing the front bumper will have any effect on how the air bags operate. I figure the activator must be somewhere in the bumper. 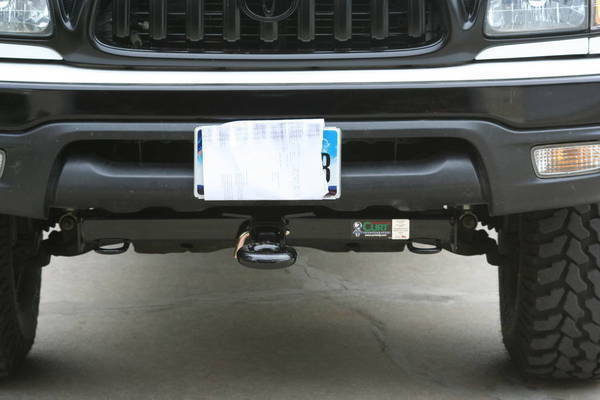 I'm not sure if this is possible, but have you thought about a custom made plate bumper and having them put the hitch in the bumper? I know they do it for the rear of the truck, maybe they could for the front also. It'd look nice too. cbi makes a hidden one for the 2nd gens. I would contact them and see if they have done anything for the 1st gens. i know curt manufacturing makes them, just not sure if theyre available for the '99. TW member BRP27 has one on his truck but his is an '04. cant tell ya how it works yet, i just put it on like a week ago, but seems pretty strong. Sweet - Did you build it yourself? yes sir! its been a project that has been going on for a while now. just havent had the time to finish it all. 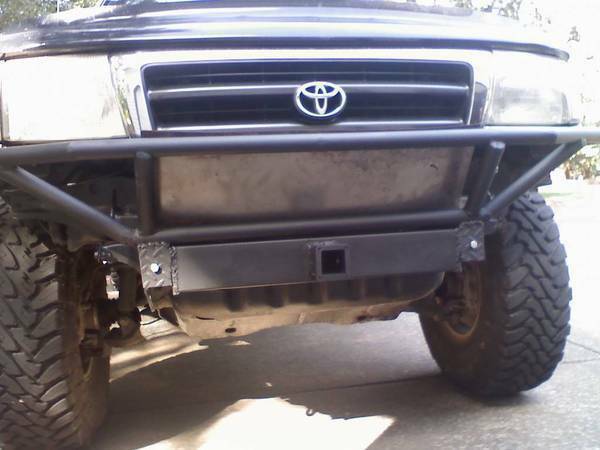 Here's the bumper a buddy of mine built.